Would you like free wi-fi with that soda? I don't know who this handsome young Japanese business man is, but he got his 15 minute of fame this week after a photo of him went viral. 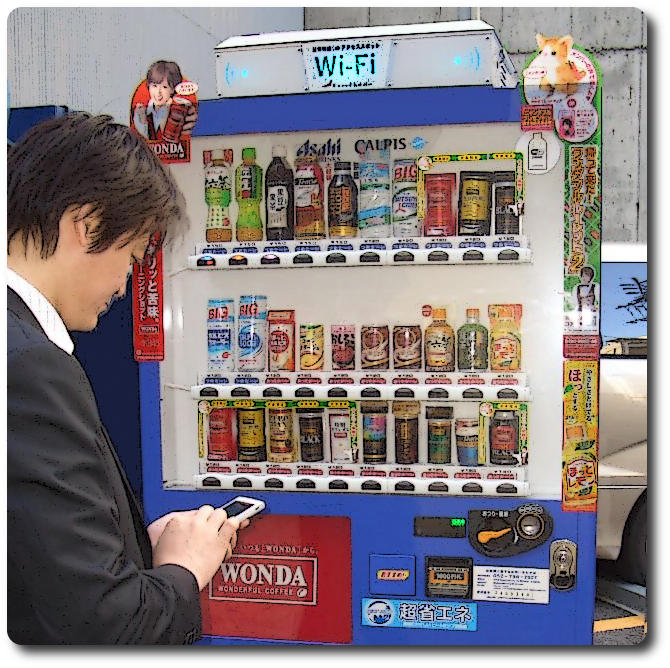 In the photo, he's using the latest free wi-fi-service...from a soft drink vending machine! I got this link from a member of our Coca-Cola collector's club on Facebook, who was asking when Coca-Cola would get this technology. If this pilot program in Japan works, it probably won't be long. The company that is testing the program is Asahi Soft Drinks Co. Ltd, and the machine is able to handle 3G, WiFi or Wimax connections for up to 30 minutes, and up to 50 meters away. Of course, the machines also still dispense drinks, and run ads when no one is using the w-fi. The real test will come when people begin to catch onto the fact that these hot-spots are available, and begin competing for the connection. There may also be security concerns, which will need to be worked out, with so many customers using the same hot spot within a relatively small space (similar to the concerns present at any publicly-accessible hot spot). And then, of course, there are always unintended consequences. For example, will there be pedestrian or even vehicle traffic congestion around these new hot spots, which could potentially become more of a nuisance than they're worth? Still, the technology is brilliant, and my guess is that these machines will quickly find their way into airports worldwide, then into malls and service stations and public event venues. They are already paid for by advertising on the machine. As they become more popular, they will likely be able to also include advertising on the customer's phone to keep the service free and/or a premium version that would get rid of the ads. If this technology becomes mainstream, expect any business which includes public machines or kiosks in their marketing program to start looking to see if including mobile hot spots in their vendors is a good option. Soon, " free wi-fi" signs might be just about as common as "ATM" signs. After all, you can't stop progress. Happy New Year, everyone!